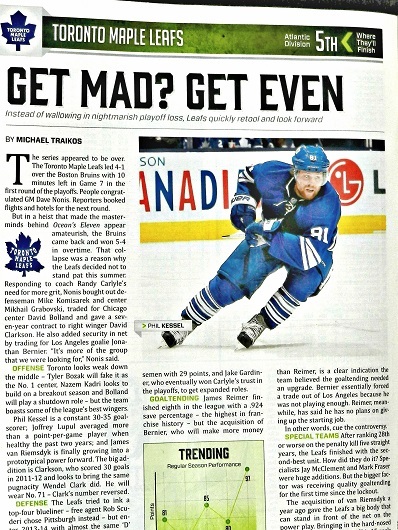 TORONTO (Sep. 19) — So, the Leafs have made it clear that they can win the Stanley Cup by loading up on forwards while comparably ignoring their blue line. Good luck to them. And, to those that concur. Correct on both counts. But, then, Damien fudged. “For the Capitals, John Carlson got Norris votes but finished far behind winner Victor Hedman.” Also true. What Damien didn’t say, however, is that Carlson enjoyed the caliber of season that virtually all Stanley Cup winners require from a blue–liner — leading National Hockey League defensemen in scoring (68 points in 82 games); then continuing in the Capitals’ championship surge with 20 points in 24 games. That Carlson failed to generate Norris votes does not alter my long–standing position. Look at a Cup–contending team and you’ll see, far–more–often than not, at least one authoritative, puck–moving defenseman. As for Vegas, what the Cinderella expansion team accomplished cannot be suggestive of a trend. Nor was it a fluke; the Golden Knights were authentic in their first NHL season. But, nothing of its kind will ever again happen in the history of professional sport. Cox also wrote: “The next time you hear somebody on television or radio say the Leafs need to get a star on defence, or need to get a big body, or when you read somebody making that same type of argument in print, remember that’s not how [rookie general manager Kyle] Dubas thinks. At all. And he’s a fellow who, ever since he was in the Soo (running the Ontario Hockey League Greyhounds), doesn’t mind thinking a little differently than the next fellow.” But, thinking “differently” doesn’t automatically equate to thinking correctly. I seriously doubt that Nashville counterpart David Poile is apologetic about loading up his back end with P.K. Subban, Roman Josi, Ryan Ellis and Mattias Ekholm. No, the Predators have not won the Stanley Cup. But, they advanced to the final in 2017 and are perennially at or near the top of the NHL standings. Tampa Bay hasn’t won a Cup with Hedman, yet I contend the Lightning wouldn’t trade the lanky, dominant Swede — straight up — for any of the Leafs’ forwards; Auston Matthews included. Drew Doughty has two Cup rings in Los Angeles; Duncan Keith three in Chicago. Nicklas Lidstrom won four championships with Detroit. 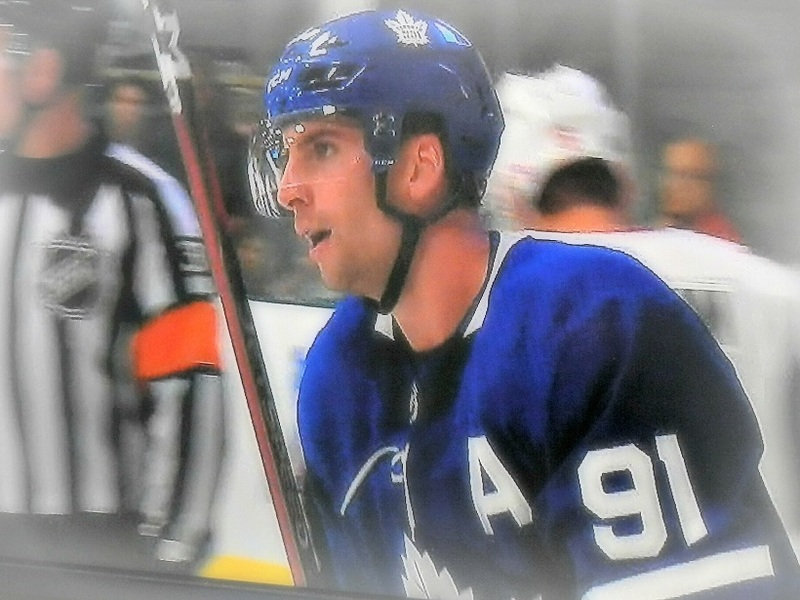 LEAFS HAVE PLACED THEIR MONEY AND HOPES WITH A KILLER BRIGADE OF FORWARDS — LED BY VETERAN JOHN TAVARES — COMPENSATING FOR DEFENSIVE HOLES ON A STANLEY CUP TEAM. San Jose’s Cup opportunity increased substantially after acquiring Erik Karlsson, last week, from Ottawa. Nor is it difficult to imagine Toronto’s hopes soaring even farther with any of Hedman, Doughty or Karlsson? So, please, spare me the narrative that hockey is moving in an all–new direction. It is unassailable fact that only two Stanley Cup teams since 1993 have been devoid of an all–world defenseman: the 2006 Carolina Hurricanes and the 2017 Pittsburgh Penguins (Kris Letang missed the playoffs after undergoing neck surgery). Some may argue the 2004 Tampa Bay Lightning were similarly barren, yet Dan Boyle was a darn–good facsimile. Every other club since ’93 (and virtually all beforehand in the post–expansion era) possessed one mega–star on the blue line — from Lidstrom, Letang, Keith and Doughty… to Scott Stevens and Scott Niedermayer (New Jersey)… Zdeno Chara (Boston)… Niedermayer and Chris Pronger (Anaheim)… Derian Hatcher and Sergei Zubov (Dallas)… Ray Bourque and Rob Blake (Colorado)… Brian Leetch (New York Rangers). Carlson, by this (or any) standard, put together a Stanley Cup–caliber season for Washington. Dubas acknowledged this week that the Leafs are following the new “trend” by loading up on forwards at the expense of the blue line. Cox was most–correct when he wrote: “Does that mean Dubas would never go out and get a player like Erik Karlsson? Or wouldn’t have been interested if Drew Doughty had made it to unrestricted free agency next summer? Not necessarily, but it seems more likely the Leafs intend to build their defence from within for reasons of philosophy and economy.” Exactly. The Maple Leafs have put themselves in a position where they cannot afford — under the salary cap — a Top–6 NHL back–liner. I would call it more of a circumstance than a “plan” — dating to the night David Nonis selected William Nylander eighth overall in the 2014 draft. Lou Lamoriello followed with Mitch Marner (2015) and Matthews (2016)… because they were the best players available at the time. Same with John Tavares in the 2018 class of unrestricted free agents. It wasn’t at all designed to start a trend. Had the most–gifted players from 2014–16 been defensemen when the Leafs made their first pick, Toronto would, today, resemble Nashville. 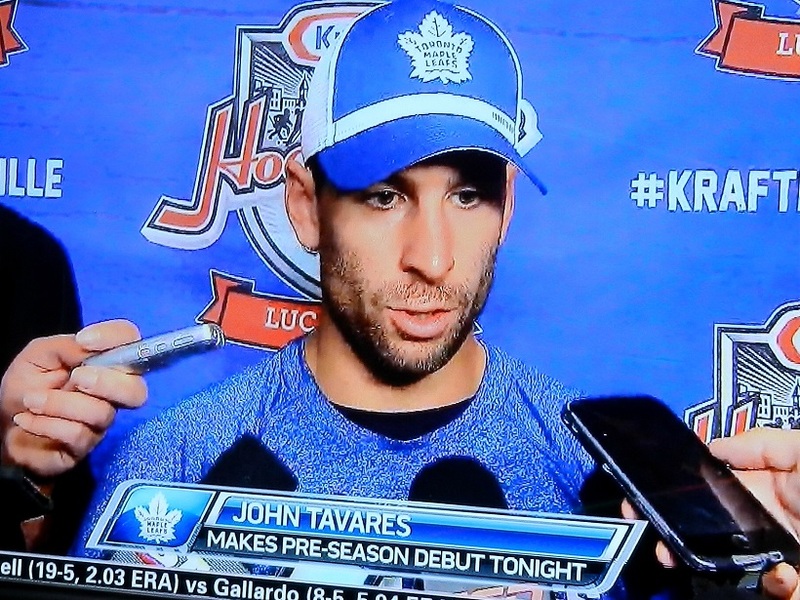 JOHNNY T. SCORED TWICE IN HIS LEAFS EXHIBITION DEBUT AGAINST OTTAWA TUESDAY NIGHT. Again, this doesn’t preclude the Leafs from winning a Stanley Cup with Morgan Rielly, Jake Gardiner, Travis Dermott and Nikita Zaitsev as their Top–4 D. Yet, by so doing, they would not follow any established pattern. Yes, there was one similarity between the Maple Leafs of today and the club of five years ago today — each coming off a gut–wrenching, Game 7 loss at Boston in the opening round of the playoffs. Otherwise, just about everything is different. The Leafs of September 2013 were embarking on a full regular–season after making the playoffs in the 48–game, lockout–shortened schedule of January to April. It was the first time in nearly nine calendar years that Toronto appeared in the Stanley Cup tournament (and first in the salary–cap era), having previously qualified in 2004. The seven–season drought was, by far, the longest in franchise history; not since 1927–28 had the Leafs missed the playoffs in three consecutive years (a stretch equaled afterward by the clubs of 2013–14 to 2015–16). 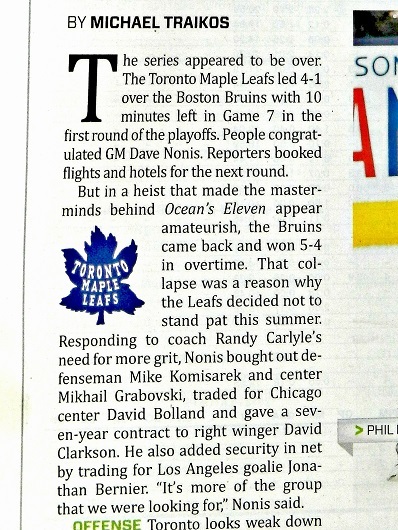 David Nonis was general manager; Randy Carlyle the coach. The Leafs were still structured around the failed nucleus of Carlyle, Phil Kessel and Dion Phaneuf. 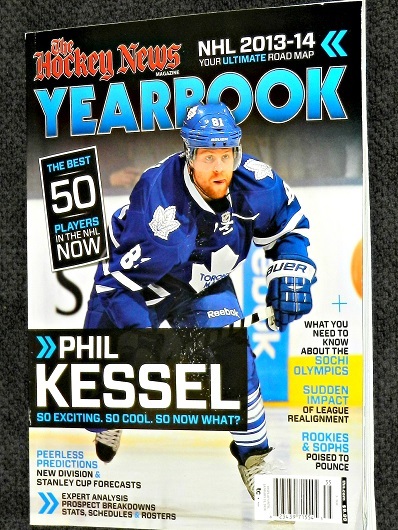 As evidenced by the cover and contents of the The Hockey News 2013–14 Yearbook, Kessel and Co. were hoping to rebound from the blown, Game 7 opportunity at TD Garden (May 13, 2013), during which the club infamously coughed up a 4–1 third–period lead before losing in overtime on a goal by perennial Leaf–killer Patrice Bergeron. Unlike today, there was no talk of a Stanley Cup challenge; merely speculation as to whether the team of the lockout–abbreviated season could build on its playoff appearance and near–upset of the Bruins. Ultimately, it could not. Another playoff absence was followed by the most–disgraceful Leaf season of the post–Harold Ballard era (1990 onward). After a mighty surge in November/December 2014 (10–2–0 streak), the club plummeted earthward. Carlyle was fired and replaced by Peter Horachek, who had no chance when Kessel, in particular, folded the tent. The Leafs went 1–11–1 in January; 4–18–2 in the first two months of 2015. Wholesale change followed, with Lamoriello replacing Nonis as GM; Mike Babcock signing the most–lucrative coaching pact in NHL history; Kessel traded to Pittsburgh; Phaneuf to Ottawa. AS EVIDENCED BY THE DEPTH CHART (TOP–RIGHT), ONLY ONE FORWARD (NAZEM KADRI) AND TWO DEFENSEMEN (RIELLY, GARDINER) REMAIN FROM THE MAPLE LEAFS TEAM THAT STARTED THE 2013–14 SCHEDULE. DAVID CLARKSON APPEARED TO BE A REASONABLE CATCH (FROM NEW JERSEY) ON THE FREE AGENT MARKET, AFTER SCORING 97 GOALS (30 IN 2011–12) OVER PARTS OF SEVEN SEASONS. BUT, THE SIGNING BACKFIRED. CLARKSON, A TORONTO NATIVE, SCORED ONLY 15 GOALS IN 118 GAMES FOR THE LEAFS. HIS SEVEN–YEAR, $36.75–MILLION CONTRACT WAS TRADED TO COLUMBUS (FEB. 26, 2015) FOR NATHAN HORTON’S SEVEN–YEAR, $37.1–MILLION PACT. WITH HORTON ON LONG–TERM INJURED RESERVE (LTIR), AND NO HOPE OF RETURNING, THE LEAFS WERE ABLE TO ELIMINATE CLARKSON’S FINANCIAL BURDEN. 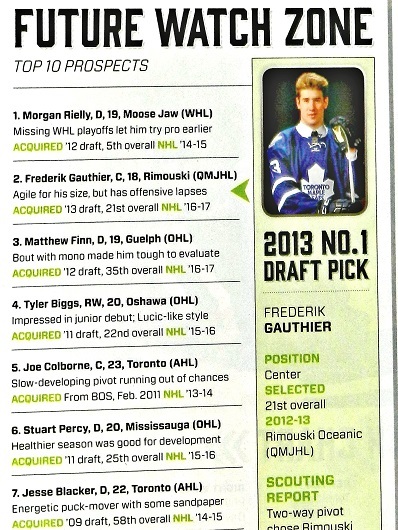 AND, THE HOCKEY NEWS 2013–14 YEARBOOK FORESHADOWED THE FUTURE FOR THE MAPLE LEAFS. 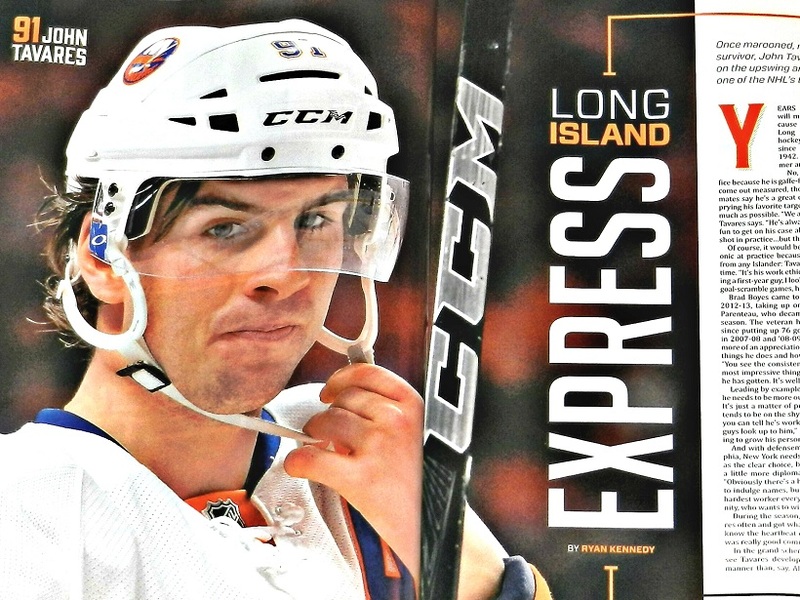 THE BIGGEST GAFFE: I wrote in my last blog about the NHL discontinuing publication of its annual Guide & Record Book — ending a tradition that dated nearly 90 years. The Guide was always a top–notch production, from its in–house years to the final two decades, as published by Dan Diamond and Associates. 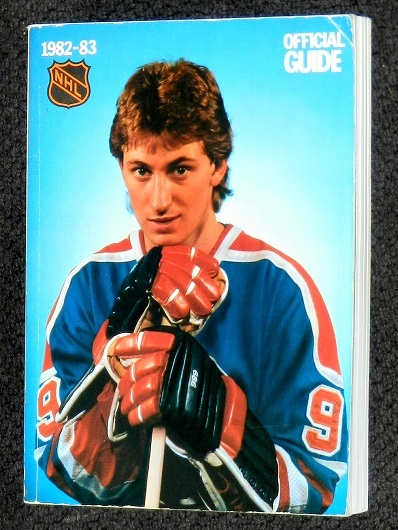 Likely never in pro sports history, however, has there been such a proof–reading mistake as in the 1982–83 edition. 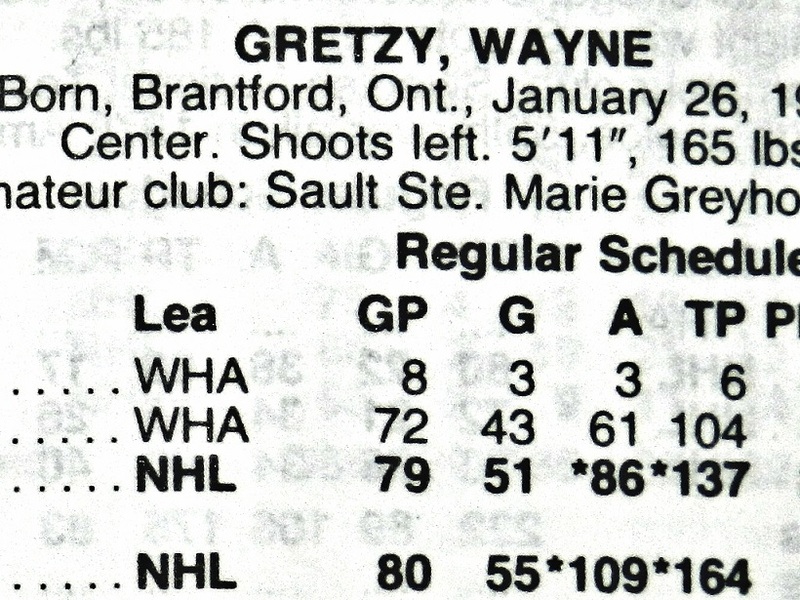 Wayne Gretzky had just re–written the NHL record book with a 212–point season in ’81–82. His reward? A mis–spelled last name in the ’82–83 Guide (as evidenced, below). The ‘k’ is still out there, somewhere. 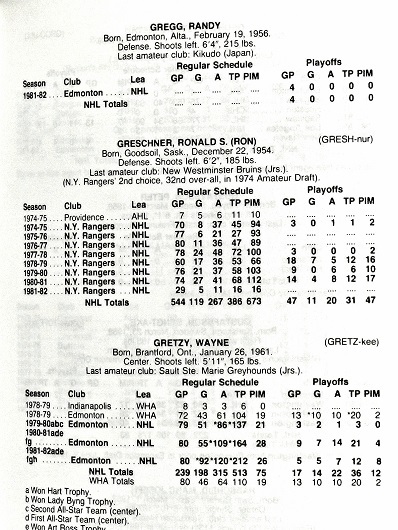 Can you imagine the league spelling hockey’s all–time greatest defenseman “Bobby Or?” Neither can I. Reverse questions: Washington’s two top point scoring D men were Carlson (68) and Orlov (31). Let’s say, for argument’s sake, those Dmen were on the leafs in 17-18 in exchange for Rielly (52) and Gardiner (52). Does that make Toronto a cup contender? Does that make Washington NOT a cup contender/winner? I repeat: Washington had the points leader among NHL defenseman last season… and he was even better in the playoffs. Jumble names any way you wish. I’m just providing you fact. How was that name jumbling? I picked the two top scoring dmen on both teams. The root of my question boils down to this being a team sport and ponders if having the top scoring defenseman makes up for your next top scoring defenseman being ranked 55th, versus having the 15th AND 16th top scoring defensemen. 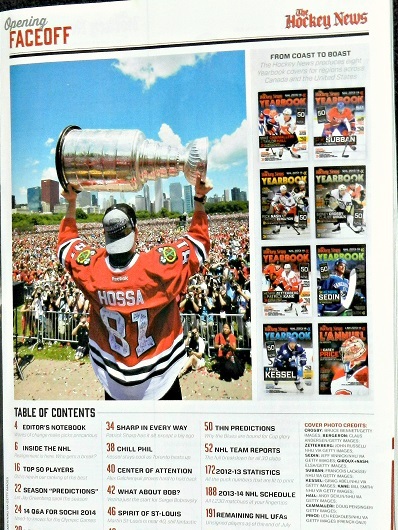 Howard, Carlson is simply not god enough defensively to be considered a #1 D you need to win a cup. Orlov and Niskannen handled the real hard minutes. Are you aware Morgan Rielly at ages 23 and 24 has been top 5 2 years in a row for QOC minutes? (This means toughest minutes in the entire NHL). Rielly is well on his way to passing Carlson as a DMan. Mark: You can deal in theory. I’ll deal in fact. Washington DID win the Cup with a 68-point effort from Carlson, tops in the league. More importantly, he increased that scoring pace in the playoffs. Rielly hasn’t been out of the opening round yet. Anything inaccurate here? I am not a big fan of only speaking about points. 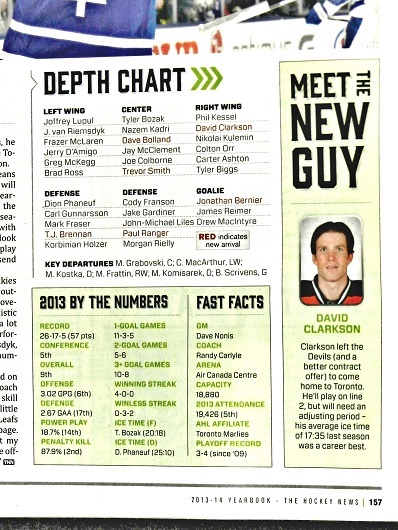 I just don’t agree about Carlson being named as proof Washington had that #1 Stud D you need to win a cup. He had a career year as a UFA, but still does not possess the defensive presence of a Doughty and I really feel Rielly is already very close to Carlson, and actually plays a much tougher role and is much younger. When the tough defensive matchups came about, Carlson left the ice. Rielly stays on and faces brutal defensive matchups every game. I am curious why, if Carlson is a #1 D you feel Rielly is not? What Damien likely meant is Carlson is just not one of those top-notch Ds due to his rather ordinary defensive play and sheltered minutes, and is more like a Rielly than a Doughty. It’s a team game, so I really don’t hold Rielly not being out of the first round against him. The main reason I feel Rielly is not a No. 1, front-line defenseman is his coach. Mike Babcock famously called him “a real good No. 2”. Couldn’t agree more. And, why are you taking credit from Carlson? He did exactly what a Cup-winner needs. And, again, got even better in the playoffs. I’m not suggesting he’s a Hall-of-Famer; in fact, may he DID have a career year. But, he was 16 points better than any Leafs d-man… and four playoff rounds better. Give him his due.